Today, the authoritative insider portal smartwatch zone has published the expected release date of Xiaomi Amazfit Bip 2 – the presentation will take place in the summer of 2019. Sources close to the manufacturer say that the conference dedicated to the presentation of the new gadget will take place in June, it is possible that the watches themselves will go on sale a little later. Let’s remind, earlier the financial director of the company Huami, which owns the brand Amazfit, announced the release of fitness bracelet Xiaomi Mi Band 4. Thus, the Chinese manufacturer has planned the release of two major new products for the summer. Not much is known about the new generation of smart watches. Foreign media report that users should not expect a large number of new features. 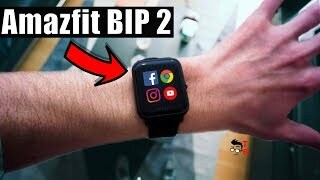 Xiaomi Amazfit Bip 2 will differ from the previous model with an updated design. Developers are planning to carry out a minor hardware upgrade. For example, to use the Bluetooth 5.0 module. According to rumors, the Chinese manufacturer plans to present at least 5 colors of smart watches Xiaomi Amazfit Bip 2. The device is equipped with advanced sensors GPS and Glonass. Positioning accuracy will increase noticeably. Battery capacity varies between 190 and 200 mAh. The battery life is up to 30 days. Let’s sum it up. Developers have slightly reduced the display, and also equipped it with a protective glass Corning Gorilla Glass of the third generation. The bet is made on the creation of a fashionable accessory, and the functionality has gone into the background. In our online store you can buy a smart watch Xiaomi Amazfit Bip 2 at a reasonable price.